With a 7" x 3/16" thick blade of razor sharp AUS 8A Stainless steel and a very comfortable no slip Kraton handle. This is my knife of choice! With an overall length of 11-3/4" and weighing in at no more than 9oz. this one is not going to wear you out using it. Comes with a very nice Secure sheath to help you avoid losing it in the wild. Also has a nice black coat finish that stays as you can see from my posted pictures does not come off with normal use. For me this was a very hard decision because like most. I have several knives to choose from. I have hiked most of the United states and Mexico and all of those adventures I had nothing more than my trusty Swiss army tinker pocket knife ! Which I can not live without, But that was with the benefit of having camping gear and a tent. If I was being forced out or had to move quickly and build shelter, set traps and just live everyday It would have to be this knife. 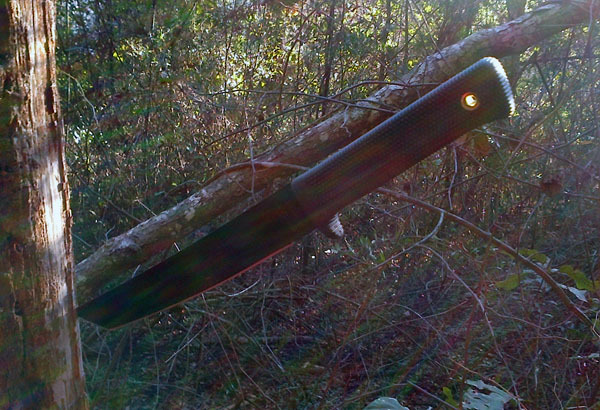 With the tanto style point you can pry without worry of breaking off the point of your knife. Don't look at me like that you all know we have all done it at one time or another. 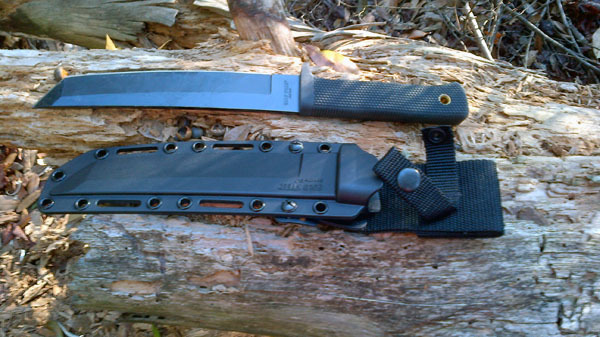 For that reason this is the primary knife that goes every where with me in my Bug out Bag. Here I am with it gathering material for setting snares for those pesky zombies that keep finding our camp! It is light enough to those everyday jobs but tough enough to take beating on with a log or rock to get through larger material. 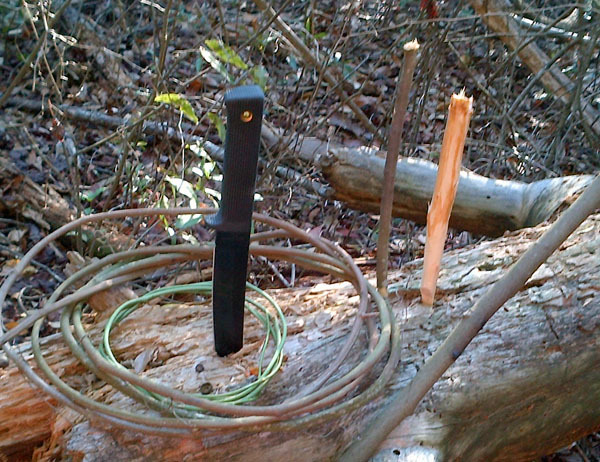 Although having a good knife is nothing if you don't know how to use it properly to survive. You have to get out there and practice making traps and building a quick impromptu shelter to make sure when you do need it you don't have to guess.